In celebration of Mother’s Day, here are two settings of Songs My Mother Taught Me by the Czech poet Adolf Heyduk. You may be familiar with Antonin Dvořák’s famous song, written in 1880 as part of the cycle, Gypsy Songs, Op. 55. Fritz Kreisler later transcribed it for violin. Here you can hear it played by Itzhak Perlman and then sung by American tenor Richard Crooks. Like so much of Ives’ music, this song enters hazy, dreamlike territory. At 1:29 the music drifts off into silence (“from my memory’s treasure“). When the A section returns at the end of the song, notice that Ives adds a crucial new chord (2:08) which wasn’t there the first time. Also listen for the ghostly echo of the final piano note. 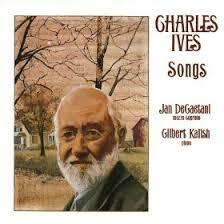 To hear more music by Charles Ives visit my previous posts, A Charles Ives Thanksgiving and The Unanswered Question. This song is my favourite–first came across the music and lyrics in 1957 when I was 17.
so tender, nostalgic and heart-warming. Dvorak was a master of melodies just like Schubert.